Faraon Mild Jalapeno Halves are seedless and ideal for serving with shrimp, tuna, cheese, pineapple, meat, guacamole and anything that you may create! It's great for appetizers or as a quick and simple addition to any plate. 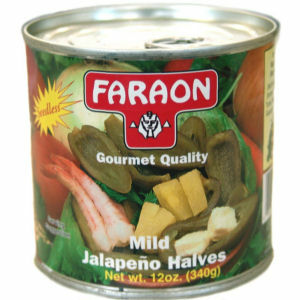 You can rest assured that adding Faraon Jalapeno Halves to any dish will be greatly appreciated and enjoyed by every one. Packed with great care for quality and good taste.